This is a bit of side-step from usual Loose and Leafy posts. It is about patterns, rather than plants and it includes two garden plants as well as wild ones. The pictures are very cropped so there's no point in clicking on them. They aren't especially interesting botanically but . . . look at their colours. Here lie inspirations for curtains and clothes. Bit of a come-down, I admit. Flowery curtains have long been laughed at. Flowery clothes can look all wrong. Not necessarily though. I'm not a designer - but I'd love to be clothed in the woods and hedgerows and snatches from garden plants. That's all - four prints in a block. There - don't they make you happy? Yes! And, they are all so different. For different moods? I think I'd use them not so much for different moods as different materials. Imagine having the Heuchera (at the bottom) to coat a sofa and the Eggs and Bacon (the yellow one above it) as small cushions chucked onto it. I think the top one (dark green leaves, bright blue flowers - don't know what it's called) would make a lovely skirt and the Sedum a waistcoat for a flamboyant young man. Yes, yes, yes, you have the best ideas! Love it! I never would have thought of those. Once in a while I see something and think: that would be a pretty fabric pattern. There is a blogger who is a fabric designer, but I have lost track of her, and my memory is completely blank related to her name and blog. I read some of her posts a few years ago before the simple and easy blogger.com's "Follow" system was set up. Town Mouse had a recent post. There is software to design board-shorts using your own photo. Try that? If this comes thru twice, please delete! I never would have thought of that Lucy even though I love having different textures growing along side each other. A lovely borage blue cashmere bolero cardigan as I love the fine hairs on the borage, and a lovely light cotton summer dress in that yellow flower - which I have not got a clue the name of. 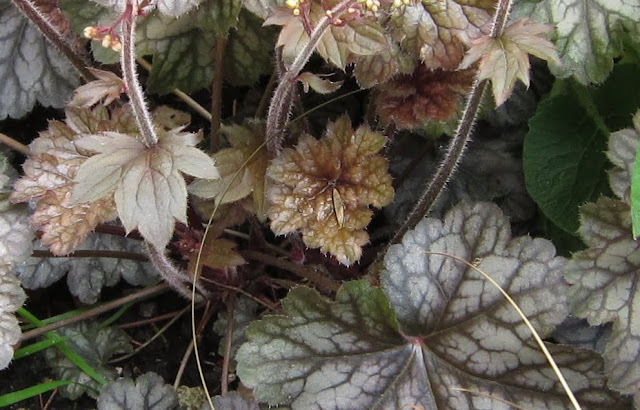 Little sandals with the pattern of the sedum and a leather bag in the texture and colour of the heuchera. I was wondering if maybe you were posting on this blog... I'm glad you are! Hope you are doing well. I've put a couple of posts on this blog but haven't been taking the kind of photos (nor in the quantity) to resume PICTURES JUST PICTURES yet. Mostly this is because I haven't been able to get out and about much recently but it's also because the quality of the photos doesn't seem to be transferring to the blog properly. Detail goes missing. I don't know whether this is due to the revised Blogspot format or I because I need to prepare the pictures differently. We'd see you coming in such bright clothes as these! The yellow flower. I was thinking this is a plant commonly called 'Eggs and Bacon' but it's a bit more substantial than I'm used to so I looked it up. 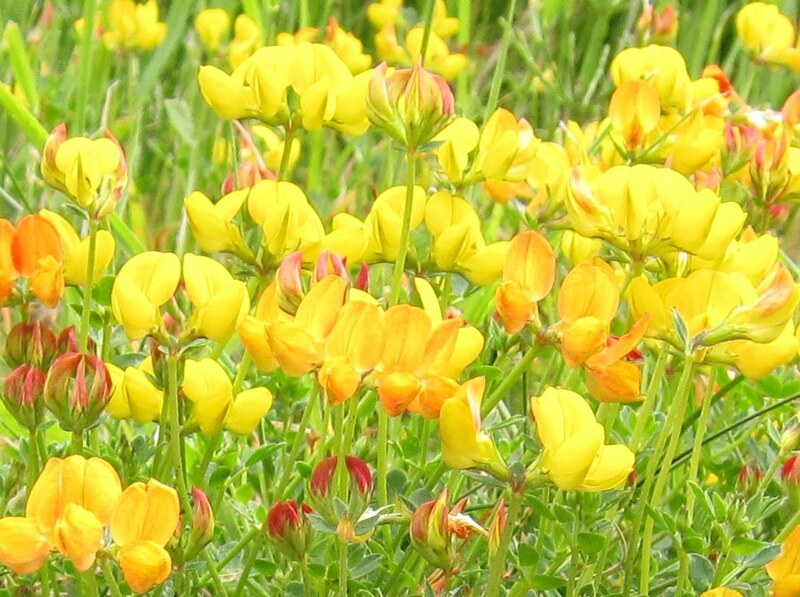 In the book, Bacon and Eggs is Lotus corniculatus (Common Bird's-Foot-Trefoil) but the leaves don't look quite right - so perhaps I'll should stick with little yellow flowers after all! 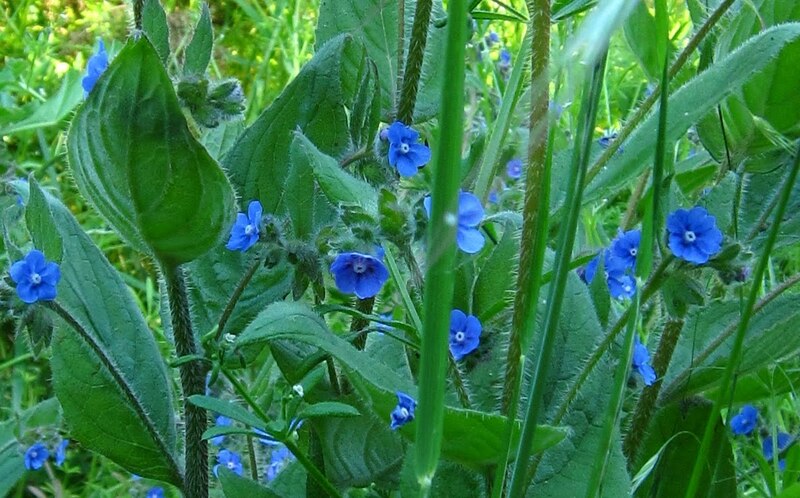 However, I do know the blue flowers aren't borage and that's quite reassuring because, if you were to see this plant in real life 'Borage' wouldn't even cross your mind so it shows how deceptive photos can be - and that means I now don't feel anywhere near as bad that I can hardly ever work plants out from books. I get stuck at 'little' and 'yellow'. 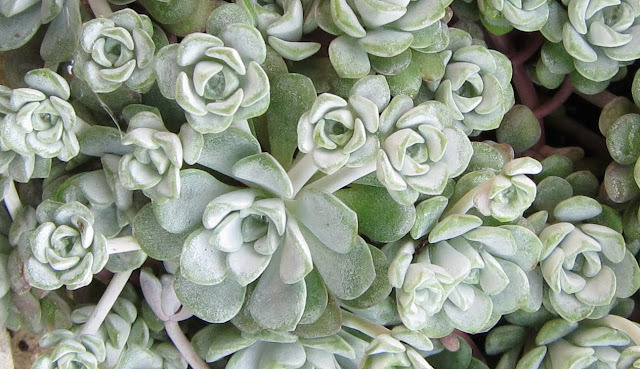 Did you ever find out more about your strange plant in the spring? I was completely thrown when you said 'board shorts'. Hadn't the foggiest idea what they are and floundered around wondering if they had something to do with story boards for films . . . perhaps they were 'board shots', not 'shorts'. That made it difficult to track Town Mouse's post because I was looking vaguely for completely the wrong thing . . . but, when I eventually found it and the site it describes - aren't the shorts they make wonderful? Thank you for drawing my attention to them. It's difficult keeping track of interesting blogs. I used to remember them by adding them into the list in my sidebar. In the end, it became unwieldy so I've relegated it to the foot of the page while I decide what to do with it.